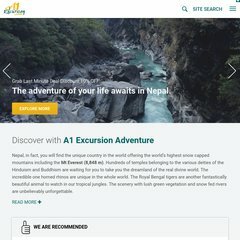 Topics: Trekking In Nepal, Everest Base Camp Trek, Popular Everest Trek, Annapurna Round, Rafting In Nepal, and Sunkoshi River Rafting. It is hosted by Bocacom Florida, using Apache/2 web server. dns2.ecreativezone.com, and dns1.ecreativezone.com are its DNS Nameservers. The programming language environment is PHP/5.3.3. PING (72.35.71.22) 56(84) bytes of data. Pinging the server, resulted in a 51.5 ms response.